Son of Charles H. and Juliet Garton, of Banstead Wood, Surrey. Grave Reference: VI. F. 17. FAUBOURG D'AMIENS CEMETERY, ARRAS Pas de Calais, France. Son of Charles Henry and Juliet Garton, of Banstead Wood, Surrey. "That the Council desires to express its very condolence with its Chairman and his family in the sad loss they have experienced in the death of Capt Herbert Garton in the service of his country and places on records the great sympathy felt by the Parish and this Council." Grave/Memorial Reference: Pier and Face 16 B and 16 C.
Son of John William and Eliza Gatland, of 17, Diceland Rd., Banstead, Surrey. John William known as Jack by his family was born on the 18th of August 1880 in Banstead Place, Park Road, Banstead. He was the eldest son of John William Gatland and Eliza Gatland (nee Fuller)who married in 1878 in Banstead Church. His father,was a bricklayer who died in Banstead in 1906, well before his sons fought in WWl. Eliza was born in Banstead and died in 1931. Jack, also a bricklayer, never married and lived with his parents. A year after he was born, the family lived in Mint Cottages. By 1887 they had moved to to Laburnham Cottages and by 1891 they had moved to Devonshire Cottages. Within the following ten years they had moved again to 17 Dicelands Road which became the family's long term home. In later years, this became the family home of John William's sister Caroline. John William had four sisters, Mary Ann, Lydia Amelia, Caroline Alice and Beatrice May and three brothers, George Edward, Edward Albert and William Albert (he always said his second name was Edward). 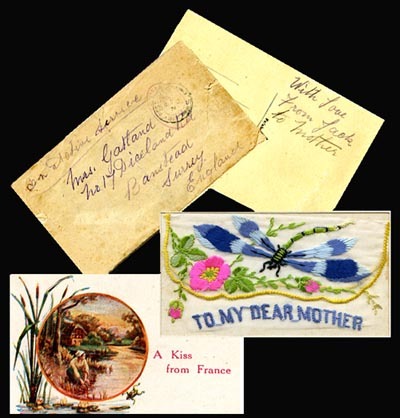 Whilst in France, John and his brothers sent cards to their mother and sisters. One beautiful embroidered card sent by John is pictured above. Private Gatland died on active service in Belgium on the 27th October 1917, at the beginning of the 3rd Battle of Passchendale (26th October to 10th November 1917). John William is buried in Artillery Wood Cemetery Boesinghe Belgium. This cemetery was used as a front line cemetery until march 1918, at the time of Armistice it contained 141 graves which 42 belonged to the Royal Artillery but it was then greatly enlarged by the concentration of 1,154 graves from the battlefields and small cemeteries of 1914 -18 on all sides of Boesinghe. It now contains 1,243 soldiers from the U.K.
John's grave is towards the rear of the cemetery which suggests that he was possibly relocated from where he fell and was originally buried. 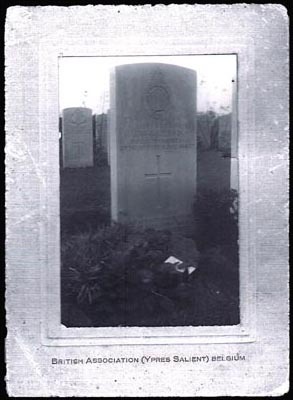 The card framed photograph of his headstone was later sent to his Mother. The wording on the headstone reads: - Rest in Peace - Gone but not forgotten by those loved ones at home in England. 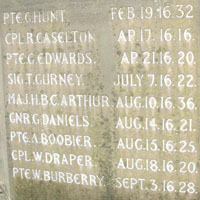 Families of soldiers were invited to put an inscription on the headstone at a cost to each letter; this would have been very expensive due to the length of the wording. John Williams's parents could not have afforded to pay for it so it is assumed that the family all helped with the cost. 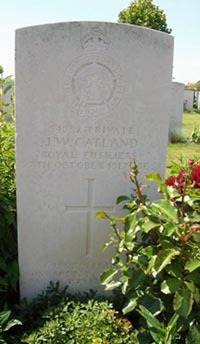 Sadly the family have no photographs of Private John William Gatland. John William's brothers also served in WW1. George Edward born 1884 in Devonshire Cottages served with the 19 Hussars in South Africa and Belgium, he was batman to Captain Guy Bonham-Carter; George was the victim of a mustard gas attack which resulted in him becoming partially sighted in addition to losing a lung. He was married, and died in 1959 in Banstead. Edward Albert Duncan born 1887 also in Devonshire Cottages, was unmarried and lived with his sister and her family. He joined up in April 1917 and was in the New Forest with the Army Mounts. He died in 1963. William Albert born 1892 in Dicelands Road joined the Army Service Corps in November 1914 aged 22 as a Horse Driver and after training crossed to France as part of the 21st division train. On one of the embroidered cards that William sent to his Mother on 15th July 1917 he asked about Jack as he had not heard from him for some time. It was just three months later that Jack was killed. 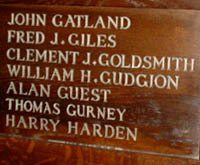 Private John William Gatland is also remembered on the Wooden Panels in the Lady Chapel of All Saints Church Banstead. Grave Reference: I. F. 7. ARTILLERY WOOD CEMETERY Ieper, West-Vlaanderen, Belgium. husband of Kate Evelyn Emery (formerly Guest), of 69, Ferndale Rd., Banstead, Surrey. The following account is taken from the one surviving page of All Saints Banstead Parish magazine. Lce Corpl. ALAN GUEST, Royal Fusiliers must be remembered amongst the Brave Banstead lads who have fallen in the fight for freedom and Fatherland. 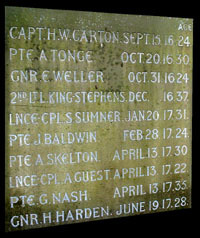 He was killed in the Great Arras battle apparently on the 13th of April. His officer writes:- "He was in the Company I am commanding. He got wounded in the attack but wouldn't go back, but continued to fight bravely. He was afterwards wounded again, mortally. I spoke to him before his death, and his last words were ; ' promise me you will tell my wife that I died like a good soldier, and I shall die happy.' Your husband was one of the bravest and most reliable men in my Company, and but for his death, I should have recommended him for the Military medal. I can assure you his death is a great loss to everyone, and I must express my deepest sympathy with you in your great loss." Alan joined up at the very beginning. He did not wait to be fetched! He was one of the force despatched to the Dardanelles, but shortly after landing he had a bad attack of Dysentry, and was sent to hospital at Malta. Returning home to England, he remained in hospital for about seven months. A year ago he went over with his battalion to France, where he........unfortunately, this text is all that survives of the Banstead Parish magazine's Roll of Honour. If you know of any copies please contact the Webmaster. Thomas Gurney was born in Banstead in the summer of 1894 and was baptised at All Saints on 26th August. His parents were Henry, a chimney sweep and carpenter, and Mary Anne. The Gurneys had eight children and Thomas was one of the youngest. The family were living at Mint Cottages, near The Mint public house, at the time of Thomas's birth. They moved to Pound Road at the turn of the century and then to 26 Diceland Road sometime between 1911 and 1914. Nothing is known of Thomas's schooldays but after completing his education, he worked as a gardener's boy, perhaps at nearby Garratts Hall. When war broke out, Thomas joined the newly-formed 8th Royal Fusiliers (City of London) Regiment. He went to France with them in May 1915 and served alongside another local man, Fred Billing of Burgh Heath. On 7th July 1916, the 36th Brigade were tasked with taking the village fortress of Ovillers. They were not the first and would not be the last to try. The Brigade on their right failed to capture German gun emplacements and so the 8th Royal Fusiliers were exposed to fire from machine-guns on their flank as well as enduring a barrage of shrapnel shellfire for the 500 yards of No Man's Land that they had to cross. The first wave of men was brought to a halt by the machine-guns, the second and third waves caught them up and they staggered on, losing men all the way. The fourth wave arrived and their momentum carried them into the German positions. They captured two strongly fortified lines of trenches and even got a foothold on the edge of the village. All of their officers were casualties and approximately 640 men were killed, wounded or missing. Thomas was reported as missing on 7th July and it was later confirmed that he had been killed. 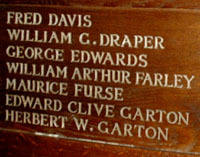 He is commemorated on the Thiepval Memorial to the Missing, on the Banstead war memorial, on the Garton memorial in the All Saints churchyard and on the panels in the Lady Chapel in All Saints. He was 21. Grave Reference: Pier and Face 8 C 9 A and 16 A.